The newest edition of Policy is designed and written to provide board members and administrators with a working knowledge of the school district governance process. Topics include an overview of public education in New Jersey; the policy development process, including drafting of effective policy language; and strategies for establishing a policy maintenance process. This volume includes discussions of legal parameters, useful definitions of terms, concepts and relationships. 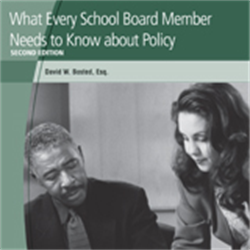 Policy is designed and written to provide board members and administrators with a working knowledge of the school district governance process. Topics include an overview of public education in New Jersey; the policy development process, including drafting of effective policy language; and strategies for establishing a policy maintenance process to keep pace with district needs. Complete with discussions of some legal parameters and instructions, useful definitions of terms, concepts and relationships, this is an essential resource for all board members and administrators.